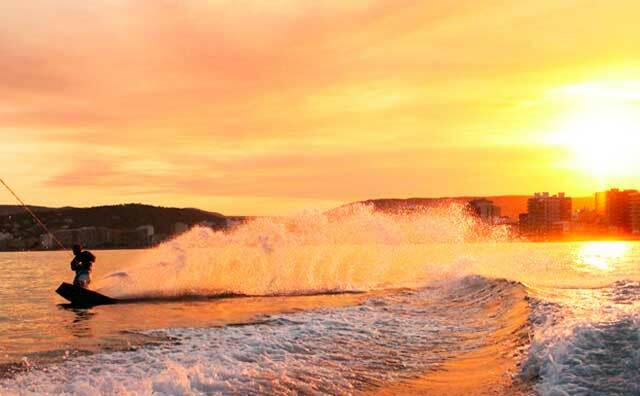 In this article we will offer you some tips to learn to wakeboard correctly. To correct our position in the wakeboard and to advance in this sport we must be clear the steps to follow for the waterstart in wakeboard. What do I do after the waterstart? Having emerged from wakeboard water, we will direct our wake board to the boat or cable that is pulling us, flexing the back leg and stretching the front leg slightly, to keep our weight on the back leg and our back stretched, with the body more Well straight. Wakeboard boards for beginners, slightly wider and more buoyant, can help you in the first attempts at wakeboarding. They will offer you greater control of the table and will be more permissive in errors. It is very usual that in our first attempts we bend our back forward, as we mentioned earlier. We will try to maintain our weight at all times towards the back leg, positioning our body straight and slightly stretched back. To maintain that position, it will be essential to keep the palonier very close to our waist. The tension of the rope can make our body bend forward, it is something we must avoid. Another one of the most common mistakes is to turn our back shoulder forward. The position of the wakeboard is unnatural, so the most comfortable position would be similar to the water ski where the arms are stretched towards the palonier. At wakeboard, we must keep our shoulders in the same direction as the board, for that same reason, we will push the palonier towards our waist with the front arm, and stretch our back arm in front of our belly also towards the palonier. We will try to keep our legs bent at all times, with the front somewhat stretched. In this way we will better dampen the chopi, or swell that may be, at the same time will be a more comfortable position for the practice of wakeboarding. Lowering our center of gravity will give us greater confidence and stability, which will help us learn to Wakeboard correctly.